This blog post will show you how to convert shapefiles to TopoJSON. We'll convert the two shapefiles we created in my previous blog post, containing all counties and municipalities of Norway. In a blog post from November last year I looked at various strategies to minify GeoJSON files. TopoJSON is an extension of GeoJSON that encodes topolog (e.g. shared borders between counties and municipalities). Polygons and lines in TopoJSON are represented by stiching together shared line segments. The shared boundary between two municipalities are represented only once, reducing the file size. Counties and municipalities are also sharing the same borders, and TileJSON are capeable of keeping both features in a single file. I won't go into detail, as the format is very well explained on this page. Add the shapefiles to a project. 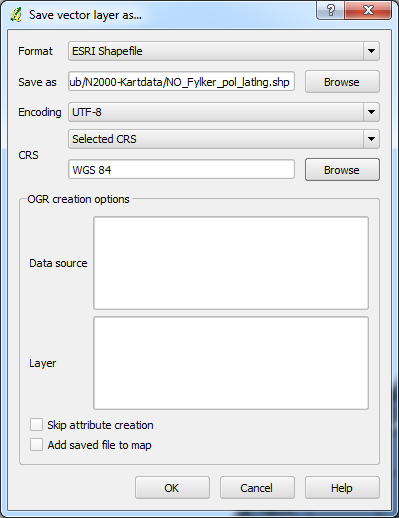 Right-click on the layer and select "Save As..."
Click CRS Browse button and search for "EPSG:4326" (Filter). Select the CRS. UTM 33 vs unprojected (latitude/longitude). In the next blog post we're start mapping with D3.js. Let the fun begin! Nice pile of wood on Foldøy island.